Filipino martial artist Rene “The Challenger” Catalan has a unique predicament on Friday, 18 August as he will be dividing his time between being a cage competitor and acting as a chief cornerman. 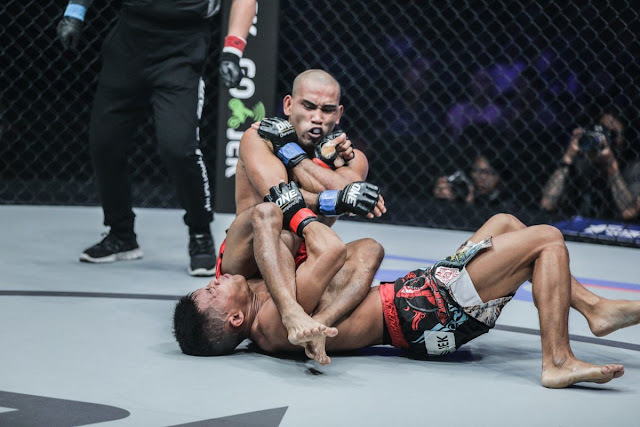 Catalan will be sharing the ONE Championship cage with grappling prodigy Bu Huo You Ga of China on the undercard of ONE: QUEST FOR GREATNESS, which takes place at the iconic Stadium Negara in Kuala Lumpur, Malaysia. Meanwhile, one of Catalan’s younger brothers, Robin, will also be competing on the stacked card as he squares off with multiple-time Lumpinee World Champion and former ONE Strawweight World Champion Dejdamrong Sor Amnuaysirichoke later in the evening. It will be the first time both family members are competing at the same ONE Championship event. Not only does he have to focus on his own match, but Catalan also has to deal with the stress of coaching his younger sibling to victory. “There is pressure, definitely, both as a coach and as a competitor, As a coach, I am thinking about my athlete’s performances. And as a competitor, there is the pressure to win, and carrying Filipino pride on my shoulders,” he admitted. Although ONE: QUEST FOR GREATNESS will surely be a busy night for Catalan, it also presents an opportunity to make some incredible memories as Catalan envisions a scenario where both he and his brother advance their professional careers by becoming victorious on the card. “It marks the first time that I will compete alongside my brother. It’s exciting. I hope that we will walk away as winners of our respective bouts. It will cause a big family celebration,” he said. Riding high on a two-bout winning streak, the 38-year-old Iloilo native will have the chance to extend his victory parade as he takes on Bu, who has won his last three outings. A proud native of a hill tribe in West China, Bu has a formidable base as a national Greco-Roman wrestling champion and has built upon that by adding elements of Wushu-Sanda, Brazilian Jiu-Jitsu and traditional Chinese Kung Fu to his arsenal. Most notably, Bu’s biggest achievement under the ONE Championship banner was when he was crowned as the ONE Hefei Flyweight Tournament Champion in July 2016. With the aim to be a more versatile combatant than his Chinese counterpart, Catalan revealed that he worked extensively on his ground game in training camp. “For this fight, I added more emphasis to my ground game. Even though I am coming off a win, I shouldn’t be complacent. I trained with the best Brazilian Jiu-Jitsu practitioners in the country to hone my grappling skills,” he bared. While Catalan recognizes Bu’s potential, he believes that his seasoned background in combat sports will play a pivotal role in their three-round strawweight encounter. “I may not have much experience in the cage, but I do have a rich background in Wushu-Sanda and boxing,” he explained. “I still believe that my striking is better than his stand-up game. I am very comfortable in that aspect. If he wants to strike with me, it will be my pleasure,” Catalan added. Catalan hopes that if he secures a decisive win over Bu, it will put him an inch closer to a date with Yoshitaka Naito for the ONE Strawweight World Championship belt. “I really hope that ONE Championship will give me an opportunity to vie for the title in the future. This bout might be the door to a world title contest. I am coming in with a game plan, much like my opponent. If I cannot take it one way, I am going to take it in another. My goal is to win. I carry with me the pride of the Filipino people. I will do whatever it takes to win,” he stated.